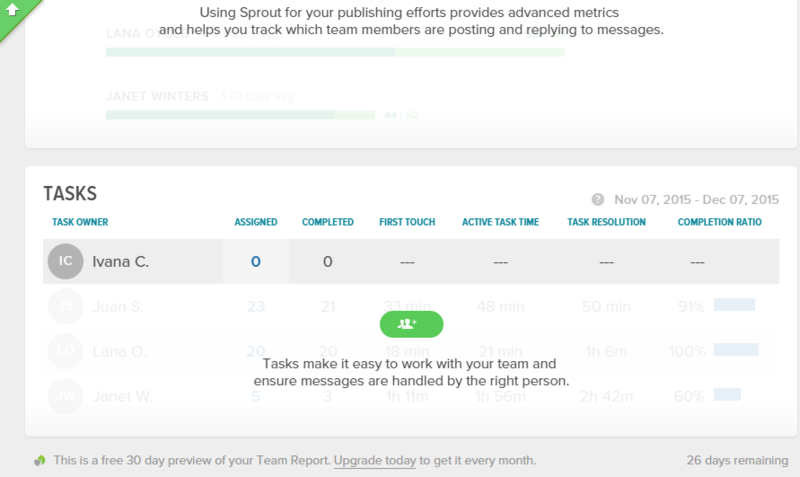 Sprout Social is a social media management software that provides engagement, publishing, analytics, and team collaboration tools. But what does this mean? Is this platform the right fit for you? 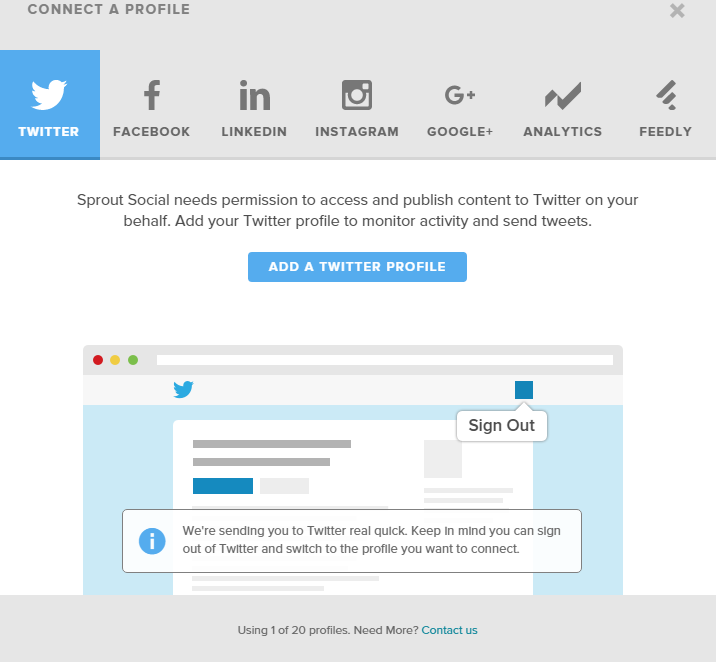 Read the main pros and cons to see if Sprout Social can meet your needs. Feedly helps you to track keywords on a different topic. You can also follow blogs, read the news or other content and share them on your social media profiles. I must be honest and highlight that this software links with the most used social networking sites, and it has nice RSS feed integration. However, everything depends on your intentions, ambitions, and goals for using a social media dashboard. 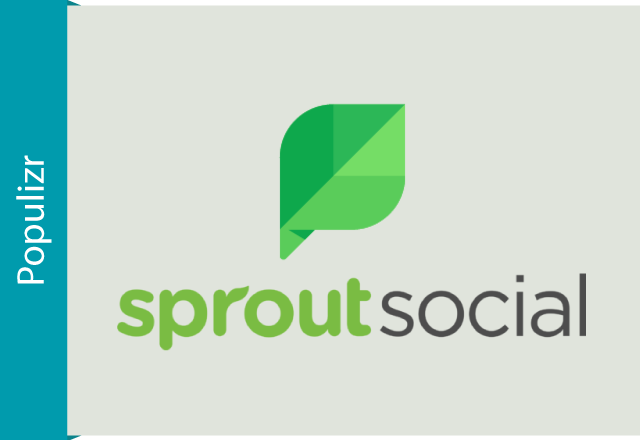 Sprout Social only supports scheduling message out up to 6 months ahead, say, from December 2015 till June 2016. This is a decision in order to encourage more personal engagement across social media platforms. When you schedule a post you can select multiple days, but only once per day for a post ( as you can see in the screenshot below). You can send your update to the social profile you prefer as many times as you wish. Sprout Social don’t impose particular time slots. Whereas, some networks may rate limit you if they see you pushing out the same content over and over. Just keep note that it has anti-spamming filters, so if you have heavy posting. That may trigger anti-spamming filters and cause messages to fail. As you can notice in this screenshot, it allows you to resend a sent message. 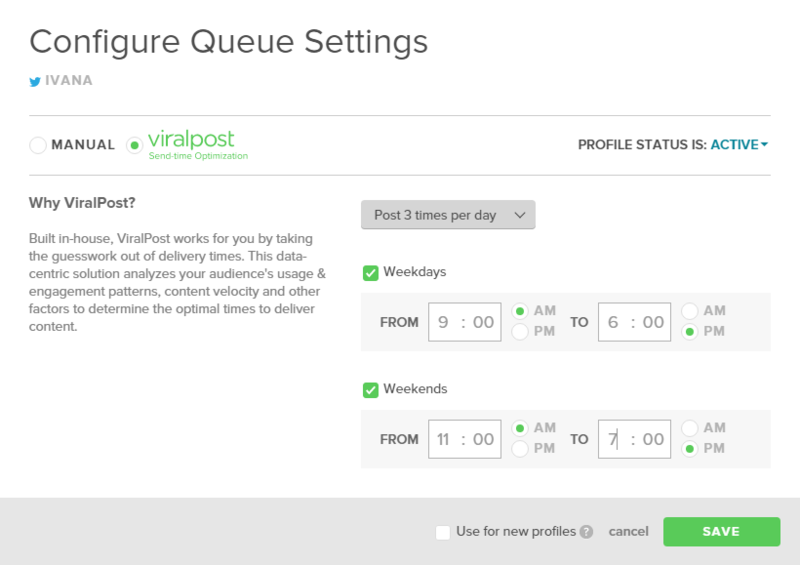 In Settings – Sprout queue you will find the ViralPost feature. That means you don’t need to set the time for manual publishing anymore. ViralPost works for you by taking the guesswork out of delivery times. This data-centric solution analyzes your audience’s usage and engagement patterns, content velocity, and other factors to determine the optimal times to deliver content. You can choose to post the same content maximum ten times a day for each social media profile. With Sprout Scheduler, you can save time, money and waste of energy. You just need to do your schedule, and it will do the rest for you. The only limit is that you can plan only six months ahead after you start using it. You can repost your update as many times you want (but only one post per day) and have the optimal engagement time. It is maximum ten posting times determined with a starting and ending period. Conversation feature is an excellent tool to connect with your audience and to boost their engagement. With the Smart Inbox you can search brand keywords, say, #social media marketing. 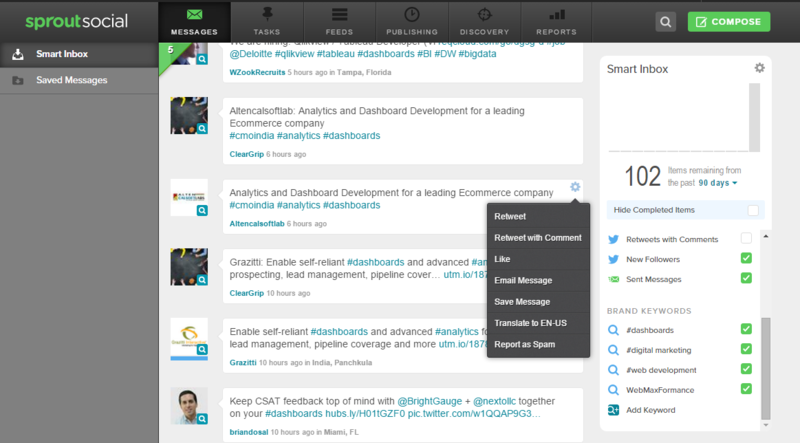 When the tweets appear, you are free to retweet, comment, reply, like, save or email the message or translate to EN-US. Which means, you have many possibilities for online communication. 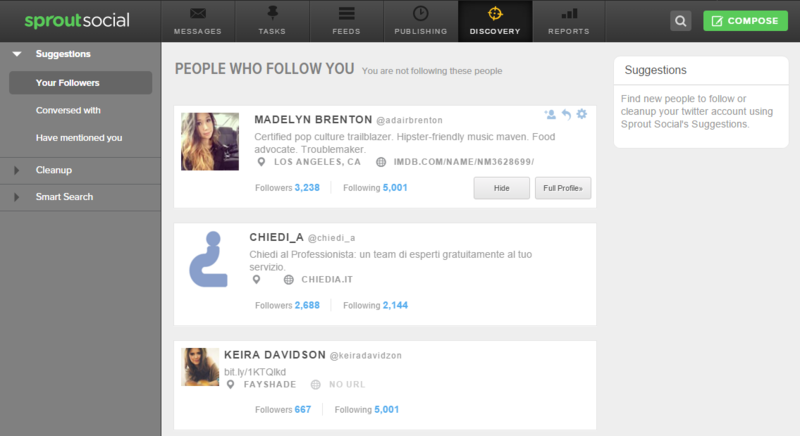 If you want to find out who follows you, who you have a conversation with and who mentioned you, click on the fifth tab, Discovery. Search for keywords or phrases that your customers would be talking about. Search for keywords that may be found in the profile of a potential client. Conversation feature strengthens your relations with the audience and helps you reach the potential clients. It’s Smart Inbox brings all your social messages into a single, unified stream.You can also track keywords and campaigns. That means many opportunities by setting up queries for keywords and hashtags related to your brand and has the results delivered right to your Smart Inbox. 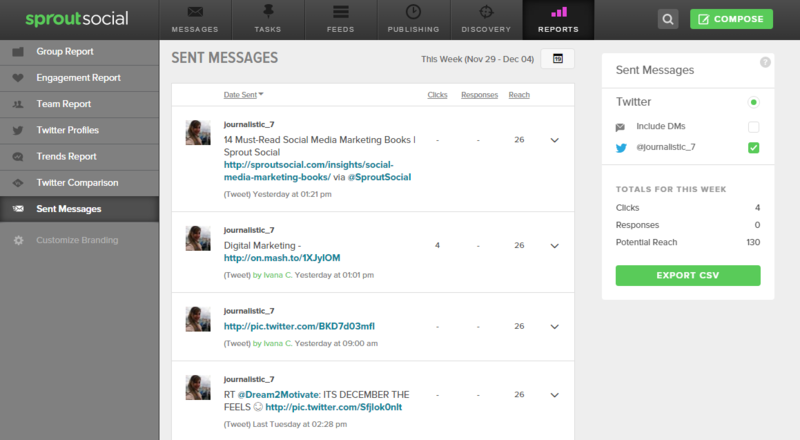 It measures performance and analyzes all your social efforts. It supplies several types of reports. Use this at-a-glance report to gain insight on the overall health of your profiles. Dig into how well your company is engaging with Fans and Followers. Gather insights about your team’s performance on social media. 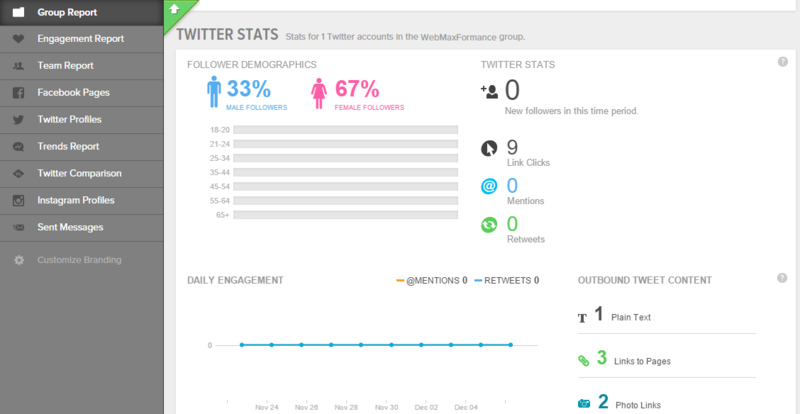 Track how well you communicate with the audience to determine Twitter performance. Gain insight into what is others say about your brand and who is saying it. 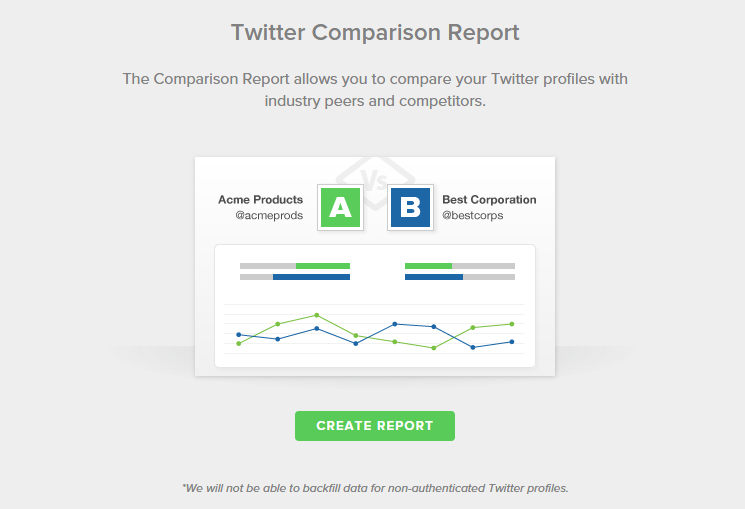 Keep tabs on your performance compared to competitors or other company profiles. View website traffic from a social lens for deeper insight on messages that drive acquisition. Determine the success of your content and make informed strategic decisions. See how every message performed so you can gain insight from your great (and not so great) content. Customize reports are a useful tool if you’re an agency managing accounts for your clients. It makes in-depth analysis for Facebook, Twitter, and Instagram (except for LinkedIn) and it integrates with Google Analytics. So with this advanced reporting, you will know what is the key to your success. 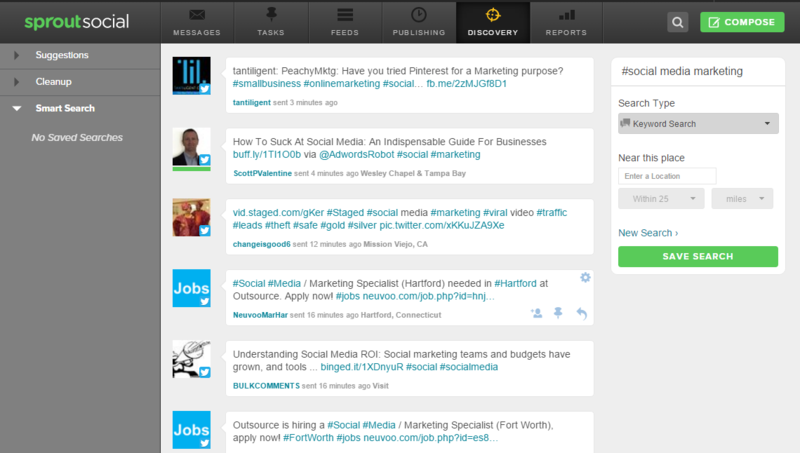 Sprout Social has an additional integration. Nevertheless, it doesn’t offer lots of opportunities, nor connection with so many popular apps. With its Browser extension, you can boost your reach by sharing anything you want with only one click. 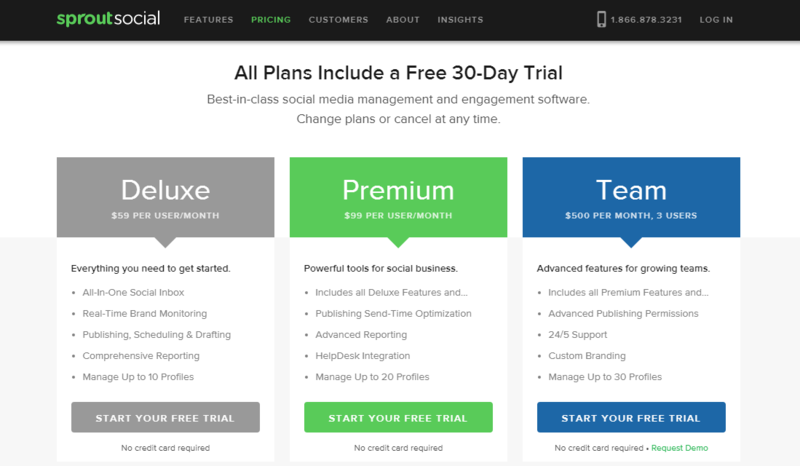 With Sprout Premium, you get only two apps: Zendesk and UserVoice. They may be useful, but not enough for outstanding social media marketing. Zendesk is a customer service platform. Designed for companies that want to create customer relationships that are more meaningful, personal and productive. Feedback forums and in-app widgets to capture the ideas users care about most. Reporting and analytics to aggregate and prioritize product ideas for your roadmap. A support ticket system to track and respond to customer support requests. As Sprout support team explains, when apps choose to open up access, they will look deeper into a possible integration in depending on the data they have received. 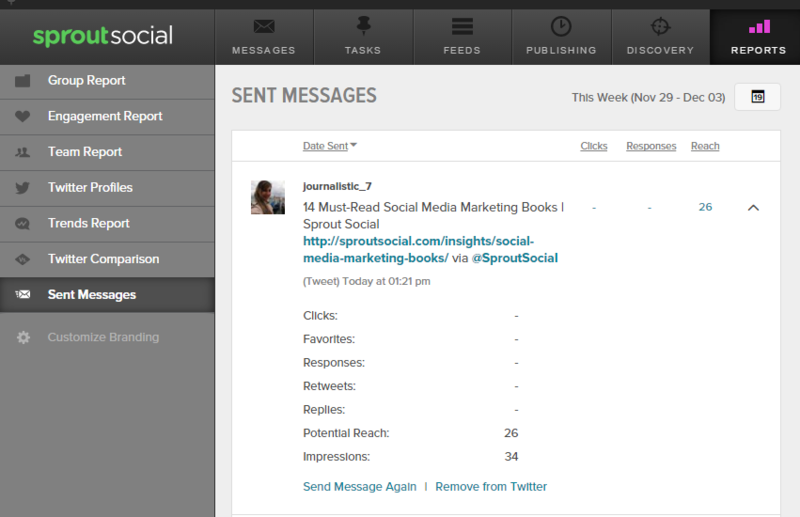 In fact, Sprout Social staff would love to add some reporting features to this dashboard when possible. This screenshot is an insight into Sprout Social pricing plans. All plans include 30-day free trial without contract or credit card. Deluxe plan will cost you $59/mo, and it includes everything you need to get started. Sprout Scheduler has many advantages but limits too. Scheduling keeps you relaxed because you are focused on what actually matters to your business, and it helps you avoid the buzz. Sprout Calendar is excellent for sending out messages on the days you want and in the best time possible. Another feature is reposting the content either in the compose box with setting different times for each day ( but only one post per day) or in Reports- Sent Messages- Send Message again. 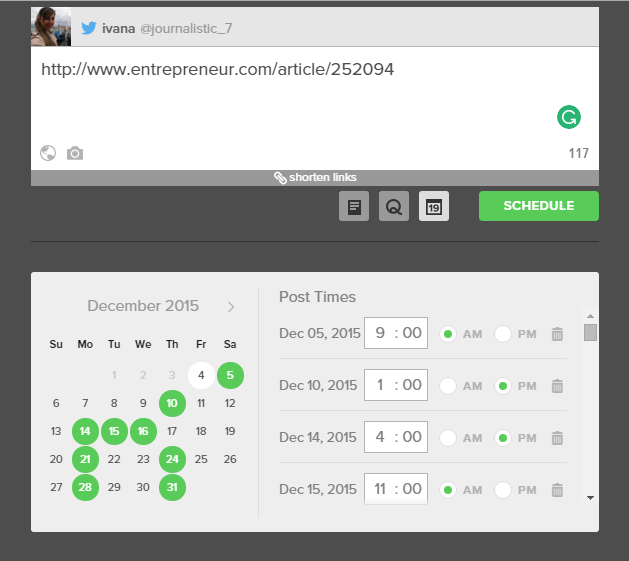 You can use ViralPost to find out the optimal engagement time for your posts. You can choose up to 10 times reposting your update. Also, you need to set the intervals, the starting and the ending period for the weekdays and weekends. As I mentioned earlier, Conversation is a solid feature that enables you to grow your business and has outstanding social media marketing. You can reply, retweet, comment, like, email the message, etc. directly from the Sprout dashboard. In general, Sprout Social has profound Analytics. You are not required to pay extra money to get points. 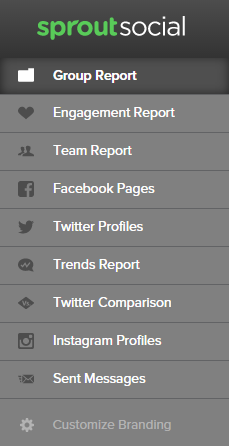 It offers around ten reports for a reasonable price, detailed insight into your social media activity. Moreover, it shows you the effects of your social media campaign. Social linking is Sprout’s downside because it connects only with 5 social media networks and two apps. Even tough it connects with the most popular social networking sites nowadays such as Facebook, Twitter, LinkedIn, Instagram and Google +, still is not enough for bold online presence. Pinterest and Youtube, as well as the blogging platforms ( Blogger, WordPress, Tumblr), are necessary for appealing social media marketing. You need to be aware that Sprout Scheduler allows you to schedule only for six months ahead. Take into consideration this fact: You can choose to schedule a post for multiple days, but only once per day for a post. That is pretty much different from Buffer Pro, which lets you select different time slots (scheduling list) for every day. The only limit considering the Analytics is that this platform doesn’t offer Analytics for LinkedIn. 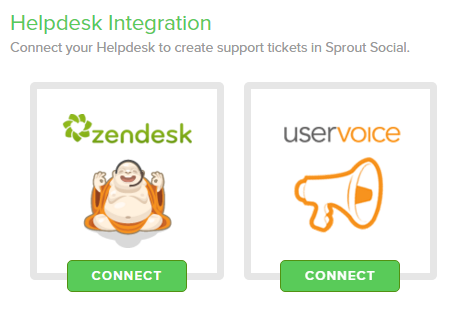 Sprout Helpdesk integration has only two apps available: Zendesk and UserVoice, unlike Hootsuite 150 apps. Almost every single day people invent new apps, and this limit of 2 apps is somehow illogical. Sprout team explains that they are not well equipped for the photo layout/format or for posting high-res images to services, but they’d love to add some reporting features to this platform when possible when apps choose to open up access for potential integration with this software. If you are looking for complete social media platform, Sprout Social still needs to develop some vital features, say, scheduling for more than six months ahead and connection with more than five social networking sites (say Youtube, Pinterest, and blogging platforms).